I've tried a few ale flavoured crisps before, but not one with cheese as an added flavour. I like cheese and I like ale. So I figured; what could go wrong? 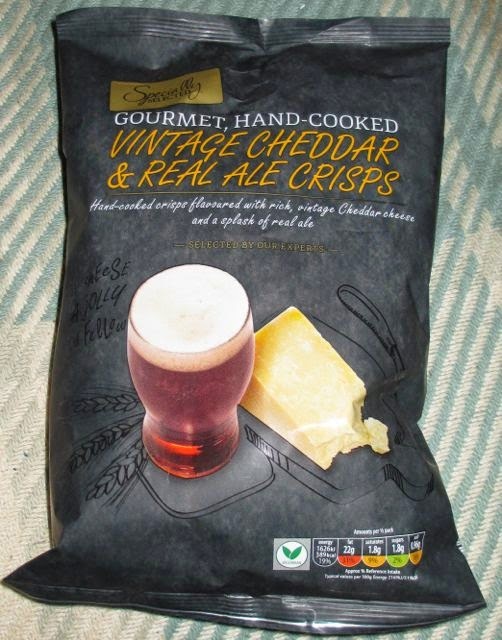 Described on the bag as a "deliciously tangy combination" of vintage Cheddar and authentic real ale, I could hardly wait to try them. The large thickly cut golden crisps inside the bag had a heavy Cheddar Cheese smell to them with a hint of barley at the end of the odour. Wow! These crunchy crisps definitely had a really cheesy punch to them. If you like cheese on your crisps without too much onion combined this flavour is for you. Mind you, there was a mild hint of onion and an ale-like barley flavour just poking out behind the cheese. The cheese and cheeky ale flavour moved into the aftertaste to leave a sumptuous cheesy beery glow to my tastebuds. It was difficult to share this big bag of crisps out with the others at the lunchtime table, but I was assured there were other bags in the store and that they would pick up some more next time! But bear in mind, they are unfortunately a limited addition. 150g bag, at 100g there are 519 calories, with 29g of fat and 2.4g of sugar. Ingredients included; potatoes, sunflower oil, cheese powder, rice flour, onion powder, yeast extract, natural Norfolk Ale flavouring, West Country Vintage Cheddar Cheese powder, and paprika extract. Suitable for vegetarians. Contains cereals, gluten, barley and milk.